Halloween brings along huge hidden dangers for a homeowner. Kids in masks have reduced visibility, and their long sweeping costumes can get stuck on things on your property. 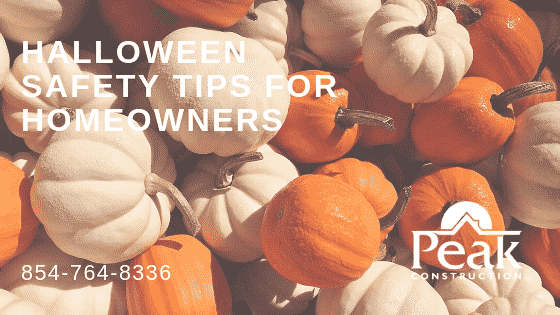 We have a few safety tips for you as the homeowner to prepare for a night of fun. The week of Halloween is a great time to make sure everything is in working order. Replace any burned out lightbulbs and, if needed, add extra lighting on the path to the candy bowl. Dark spaces are a recipe for disaster. If you will not be home during trick-or-treating hours, turn off all your lights, so no one mistakes your home as a stop on their path. Move any objects cluttering the walkway before Halloween night. Patio chairs, grills, outdoor kids’ toys, and anything else laying around can turn into a tripping hazard. Holiday decorations should be at a safe distance from the path and well lit. Kids often get excited on Halloween, running from house to house. By keeping the walkways clear, you are avoiding a slip and fall or worse. Halloween is a strange night for pets. No animal understands why people dressed in costume are coming to their home all night and they may become frightened. Unless you know your pet is good with costumes, it is best to secure them away somewhere they won’t get stressed out. Candles are a huge source of house fires in the United States every year, especially on Halloween. There are battery-powered options available to make your Jack-o-Lantern glow just as well as a real candle. The battery-operated flames are much less likely to catch anything on fire, making them a much safer option. If you do need to use real candles, be sure to use them responsibly and keep lit candles away from walkways. You don’t want any costumes to catch on fire when someone walks by. Get prepared and avoid disaster this holiday season with these tips and tricks. Creating a safe environment for trick-or-treating ensures a fun night for everyone in the neighborhood. With these extra precautions in mind, you’ll be on your way to having the best Halloween yet. © 2018. PEAK CONSTRUCTION. All Rights Reserved.